How do I enter data into SPSS for a paired samples T-test? Home > How do I enter data into SPSS for a paired samples T-test? I’m going to use this example to help you understand how to enter the data. Suppose you want to study the effect of caffeine (IV) on the number of hours participants sleep (DV). You have two conditions in your experiment, caffeine administered to participants and no caffeine administered. Each participant participates in both conditions of the experiment. Each condition is separated by one week’s time. Because the participants in each condition are related, they are actually the same exact participants in each condition, we will use the Paired Samples T-Test. Here are the data. You can see participants in each condition and the average number of hours they sleep each night. In this experiment, you want to know if there is a significant different between the data collected from each condition, caffeine administered and no caffeine administered. You want to know if caffeine really does have an effect on the amount of sleep that participants get. Does caffeine intake significantly increase or decrease the amount of sleep that people get? Is there no difference in the amount of sleep for caffeine and no caffeine conditions? Why not just look at the data? Just looking at the data, you can probably see that there is a difference in amount of sleep between the two conditions. You can probably see that amount of sleep in the no caffeine condition appears to be much greater than the amount of sleep in the no caffeine condition. People generally appear to get more sleep when they have not consumed caffeine. So why do I have to conduct this t-test? The reason is that we are not just trying to figure out if there is a difference in amount of sleep between each group. We want to know if there is a statistically significant difference. That is, a real difference as defined by statistics. The paired samples t-test will be able to tell us that. 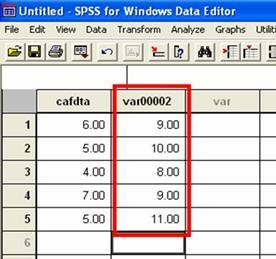 Like the Independent Samples T-test, you will use the first two columns of your SPSS data file to enter the data for the Paired Samples T-test. However, you will be using these two columns in a different way. Both columns will contain data points collected in your experiment. In this column, you will enter the DV data collected in the first condition of the experiment. In our example experiment, the first condition was one in which participants were administered caffeine. So, we enter all the data collected for this condition. See the number 6 in the first cell? That indicates that the first participant in condition 1 (caffeine) averaged 6 hours of sleep. 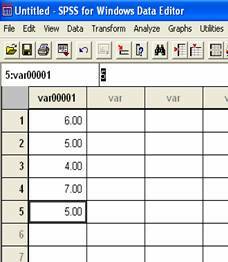 When you are finished entering the data, double click on the top of the first column to name it. The Define Variable box will pop up and you can enter a new name for the variable in the Variable Name area. Give the variable a meaningful name. This will make your life a lot easier when you analyze the data and interpret the results. Because this column represents DV data collected from the first condition of this experiment, it is a good idea to name the variable after this condition. In the below example, I decided to name my variable “cafdta.” I decided on this name because this column has data that was collected in the caffeine conditions. Click OK when you are finished using the Define Variable box and it will disappear. 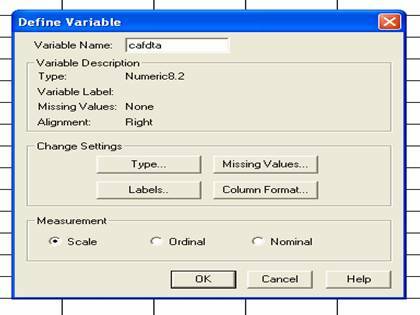 In this column, you should type in the DV data collected in the second condition of the experiment. In our example, this would be the data collected in the no caffeine condition. See how the first data point in the second column is a 9? This tells SPSS that the first participant in the no caffeine condition averaged 9 hours of sleep per night. Double click on the top of the second column to name it. Enter a name into the variable name box. The second column represents your DV data collected in the second condition. Give this column a meaningful name. In our example, I name the variable “nocafdta” to indicate that this column contains data from the no caffeine condition. Click OK when you are finished. Always remember to save your data file to a meaningful place with a meaningful name. You don’t want to lose this file and enter the data all over again. I decided to name my data file “Effect of Caffeine on Number of Hours of Sleep Data.sav.” It’s a long name but this file will be very easy for me to identify in the future.